We had such wet weather last week, with rains pouring down and gloomy skies. Going to the market required juggling an umbrella with my usual market bag, and using my free hand to inspect veggies and fruits (and trying to avoid the big drips of water from overhead make-shift awnings that seem to target my head specifically!). It also meant having to market in actual “closed” shoes as opposed to my usual flip-flops…criminy. C was woebegone as he couldn’t go biking (he’s a passionate mountain biker). I would spy him early on weekend mornings, shuffling out of bed and peering hopefully through the window blinds, then shuffling back to bed with a sigh and a resigned look. The trails would be too muddy to ride through. This week however flounced in full of sunshine! Sun blazing through the windows and hammering the streets with its heat. And though I’m tempted to turn on the a/c during the day, I resist. Opting instead to enjoy this bit of light and warmth in one of my beach batiks and my latest pair of flip-flops. I admit the heat may often drive me bananas, but sometimes it’s good to take a step back and be thankful for the blessings the sun brings me: all-year tank tops, never having to suffer through bitter cold weather, vitamin D synthesis, and protection from vampires just to name a few. No matter how yummy it may be to nuzzle back into a fluffy duvet on a rainy Sunday morning, I can’t deny the air of hope that sunshine brings with it. That’s what I’d like to celebrate with this entry to A Taste Of Yellow – hope. The hope that when many gather together in support of something, the darkness does not seem so daunting nor as insurmountable. The hope you feel when you know you have someone who will stick with you through tough times. The hope that they may find a cure. The hope that tomorrow will be sunnier, cooler, better. LiveSTONG with A Taste of Yellow is a food blogging event created by the fabulous Barbara of Winos and Foodies in support of the Lance Armstrong Foundation, to raise awareness of cancer issues. It is a platform for bloggers to share their stories, or simply their support. I have always been a great admirer of Barbara and the way she approaches life…with polish and flair and always a kindness for others. And hope too I believe. I chose these Lemon Butter Cookies (or Sablés Au Citron if you want to be cute and French…which I must admit I sometimes do) from Clotilde’s cookbook Chocolate & Zucchini, page 224. The cheery yellow of the lemon and the butter, along with the heavenly smell of lemon rind being grated, assured me that I was on the right track with this recipe. And the delicious results were all the proof I needed to know I had made the correct choice. Here’s what you do: Mix together 1 cup plus 2 tablespoons all-purpose flour, 1/3 cup granulated sugar, 1 teaspoon fleur de sel (I used one scant teaspoon), and 1 tablespoon freshly grated and finely chopped lemon zest (from organic lemons if possible!). Add 3.5 ounces (7 tablespoons) unsalted butter that is well chilled and diced. Rub the butter into the flour mixture (this feels really nice), or cut in with a pastry cutter until combined into what looks like coarse crumbs. Add one egg yolk and stir with a fork until blended. Take the dough into your hands and knead (lightly now…you’re not making a baguette) until it comes together and forms a ball. If they dough looks too dry add some ice water (a little at a time!). If it feels too sticky add some flour (a little at a time!). Now, halve the dough and roll each half into a log about 1-inch in diameter. Wrap each log in cling wrap and tuck in the freezer for a 30-minute nap (you can also freeze the dough for up to a month — freshly baked butter cookies any time you want…yay!). When you are ready to bake them, remove a log from the freezer, unwrap, and slice into 1/4-inch rounds using a serrated knife (roll the dough a quarter-turn after each slice so the log stays round). Repeat with the second log. Place on a baking sheet lined with parchment and stick into a 350F (pre-heated) oven for 12 minutes. Transfer to a rack and let the cookies cool completely before adding the glaze. To make the glaze: I only made half the glaze so to get the full quantity just multiply by two. Place 1/2 cup powdered sugar in a bowl with 1 1/2 tablespoons lemon juice – whisk until syrupy. Glaze the cookies using a pastry brush or the back of a teaspoon…or as I did here, place glaze in a ziplock bag or parchment paper cone and pipe onto cookie in any design you wish! Let cookies stand until the glaze is set. These cookies bake up to a buttery crispness on the outside and a melting flakiness on the inside, infused with a bright lemony aroma and shot through with bursts of fleur de sel. They would be perfect shared with a good friend over tea and a nice chat. Barbara has extended the deadline for entry submission to September 18 so you can still catch up! p.s. the sun was out for the past few days, but as I post this it has started to rain again…good thing I have stored a little sunshine in the form of these cookies! Can you use reg table salt if you dont have sea salt? I was also thinking of using Orange because I have no lemon, I wish I did!!! Has anyone else done this? Hi Kescribbles! I like sea salt because the slightly larger grains gives you small shots of salt…I have never tried it with regular table salt but you can try just using a little less 🙂 You can certainly try using orange…I think an orange cookie would be delicious! I wish you had just said "scant teaspoon of sea salt" it would have saved me the time of looking up "fleur de sel". I made them and they were terrible! Too much fleur de sel – it masked all the other flavours and was just unbearable! Also, the lemon flavour wasn't very apparent. I would recommend less fleur de sel and a little more lemon zest! Found these via Pinterest and they look absolutely delicious. Pinned! Is there supposed to be baking soda in these? I made them and they turned out NOTHING like the picture 🙁 They didn't rise at all and I followed the recipe to a T. They look like quarters, not cookies! Hi Anonymous — so sorry they didn't turn out well! There is no baking soda in the original recipe (I just re-checked) and they are not really meant to rise, more like "slice and baked" type cookies — so roll them and slice then to the size you want. I made these tonight and was very disappointed that they weren't very big and the lemon flavor was lacking. I would double the zest and cut the salt in half if I ever made them again…probably won't because there are so many recipes to try! I definitely have to try these. I LOVE lemon. You're not on facebook? Do you plan to start a facebbook page? What are the calorie and carbohydrate count? My husband is diabetic so we have to count everything. Awesome ! 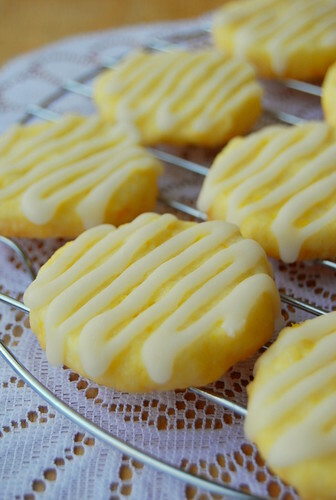 This is the lemon cookie that tops all!! They came out perfect! Gotta love a great recipe!! Going into my favorites!! They turn out nothing like the picture and they are NOT very good either. I just came across this recipe yesterday and just HAD to do it. They turned out sooooo good! They are good without the glaze, but the glaze just takes them to a new high. Thanks for this recipe!! My fiancé said that these taste like tiny hockey pucks of salt, lol. Very disappointed.